When I was trying to choose my Confirmation name my grandmother gave me two small books of Saints. The pictures were beautiful. As I read each story I came across Saint Clare. Clare was beautiful. She was an Italian noblewoman who became the Foundress of an order of nuns now called "Poor Clares." When she heard St. Francis of Assisi preach her heart burned with a great desire to imitate Francis and live a poor humble life for Jesus. So one evening, she ran away from home, and in a little chapel outside Assisi, gave herself to God. St. Francis cut off her hair and gave her a rough brown habit to wear, tied with a plain cord around her waist. Her parents tried in every way to make her return home, but Clare would not. Soon her sister, St. Agnes joined her, as well as other young women who wanted to be brides of Jesus, and live without any money. St. Clare and her sisters wore no shoes, ate no meat, lived in a poor house, and kept silent most of the time. Yet they were very happy, because Our Lord was close to them all the time. An army of rough soldiers came to attack Assisi and they planned to raid the convent first. Although very sick, St. Clare had herself carried to the wall and right there, where the enemies could see it, she had the Blessed Sacrament placed. Then on her knees, she begged God to save the sisters. When I read her story I respected her because she had material wealth yet sacrificed it for what was closes to her heart. Not growing up wealthy my desire was always to have wealth. Therefore I quickly recognized and appreciated her strength and sense of purpose. 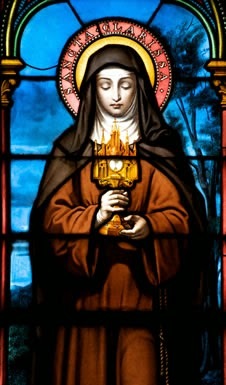 For Saint Clare, it was not a sacrifice to give up wealth. She loved Jesus enough to dedicate her life to him. A Sophisticate is a saint not because she sacrifices her wants or desires (A Sophisticate is a Sinner). She is a saint because she chooses love. In the harshness and cruelty of life, love is hard. Love takes patience, strength, and everything within you. Love is something that a person learns more about everyday. What is the difference between whether someone remains a sinner or becomes a saint? Love. When a Sophisticate chooses love instead of hate and chooses forgiveness over revenge (A Sophisticate Forgives) she lifts herself above everyone else because especially in today's world love and forgiveness are hard. Sacrifice is easy. Anyone can sacrifice what they love. Giving is hard. A Sophisticate gives rather than sacrifices. She does not take away or sacrifice what she loves. She fights and loves until it hurts. When a Sophisticate loves she creates more love and happiness around her. A Sophisticate does not choose the easy path when she has a sense of purpose. When a Sophisticate has focus, a sense of purpose, follows her heart, and believes (A Sophisticate Believes) it is easy for her to make tough choices and more importantly, be happy. When she is happy, she makes other people around her happy and creates a better world.